Practically any sport event that is held in every four years is guaranteed to be great! On Friday, September 19, 2014 (Manila Time), another international sport event will kick off in Incheon, South Korea for the Asian Games. There are 4.5 Billion Asians. 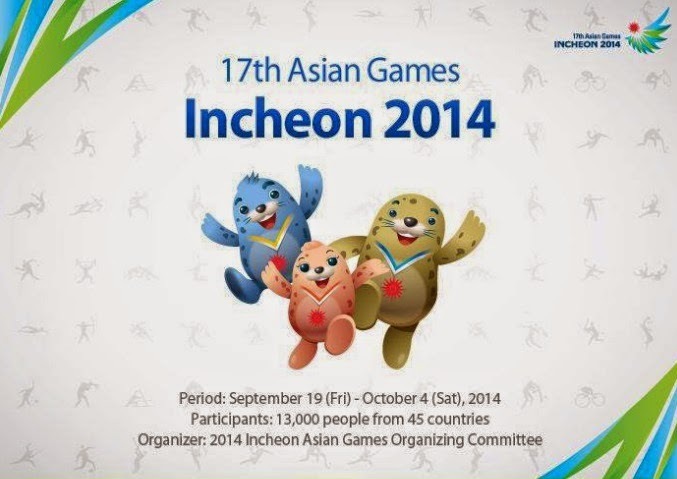 Incheon Asian Games is the 17th Asian Games. Incheon Asian Games will go on for 16 days from September 19 to October 4, 2014. 45 Asian countries will participate in 36 sports entries competing for medals. 13,000 athletes and officials will participate. Check out the video from Samsung as it supports the 17th Incheon Asian Games. Samsung has supported the Asian Games 5 times in a row, which is the longest Record. Meanwhile, around 150 Filipino athletes will be competing for 25 out of the 36 sports in Incheon. The Philippines is looking to grab golds on ten-pin bowling, combat sports, wushu and boxing. In addition, Philippines men's national baskeball team Gilas Pilipinas is facing the possibility of competing in the Asian Games with an 11-man roster after other countries reportedly protested the inclusion of naturalized center Marcus Douthit in the lineup. Gilas Pilipinas roster includes Marcus Douthit, Jared Dillinger, Jimmy Alapag, LA Tenorio, Paul Lee, Jeff Chan, Gary David, Gabe Norwood, Ranidel de Ocampo, Japeth Aguilar, June Mar Fajardo, and Marc Pingris. In the 2010 Guangzhou Games, the Philippines brought home a total of 16 medals, including three gold, four silver and nine bronze.